It's the tail end of summer, and even though I'm looking forward to crunchy apples and cute jackets, I can't quite bear to let go of balmy days and refreshing dinners just yet. So here's a soup that brings together the flavors of summer but with just enough heat and heartiness to hint at a coming fall. 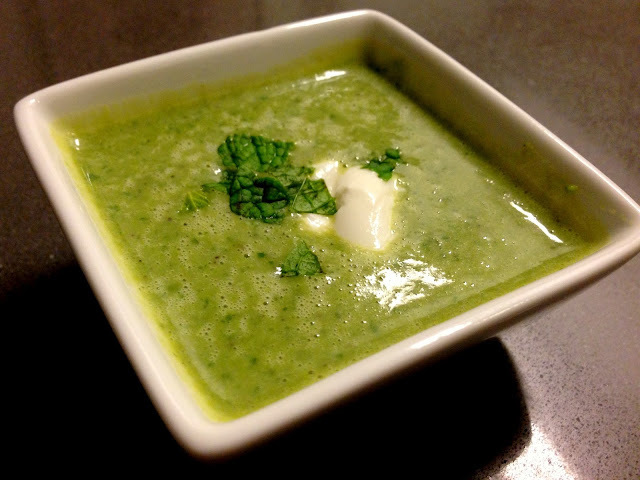 I knew I wanted to bring together these two delicious green yummies into one soup, but when browsing for recipes I kept finding things that were a little too complex for what, in my mind, was supposed to be a super easy and simple recipe. Some called for too many spices - this is just an uncomplicated, straightforward little soup at heart! 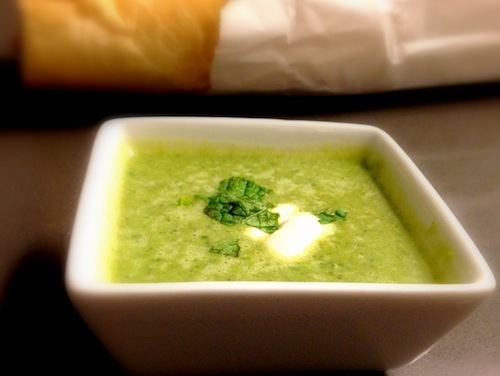 Some called for a lot of cream and butter - but this light, clean little soup would buckle under all that heaviness! And some called for discarding the onion - now that I won't stand for! I love me some onions! Although you can't taste an "oniony" flavor at the end of everything, they add such a depth of flavor that you just can't get otherwise. Picking through the vast interwebs I discarded the ideas I didn't like and kept the ones I did to end up with the perfect combination of delicate yet hearty, and flavorful without being overpowering. Heat a pot on medium heat, add in butter and stir around so it starts melting evenly. Once the butter starts to get a little brown, add in the onion and saute until it gets translucent. Add in the garlic and saute until the garlic is golden brown. 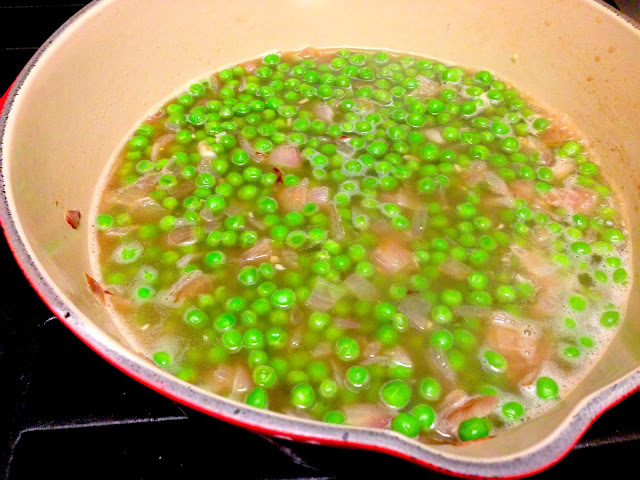 Add in the broth and the peas and bring to a boil. Add in the milk, stir in the pepper, and simmer for 5 minutes. The pepper here is really important - it's what gives the soup a nice little kick, bringing it up from your everyday ol' pea soup to something delicious and lip-smacking. Add in 1 cup of fresh mint, stir, and remove from heat. Either pour the soup into a blender and blend (careful - the hot liquid can expand, so hold the lid in place with a towel or oven mitt) or blend in the pot itself with a hand-held blender until you have a smooth puree (this is way easier). Don't worry too much if a pea or two doesn't get blended in - it just adds to the texture! 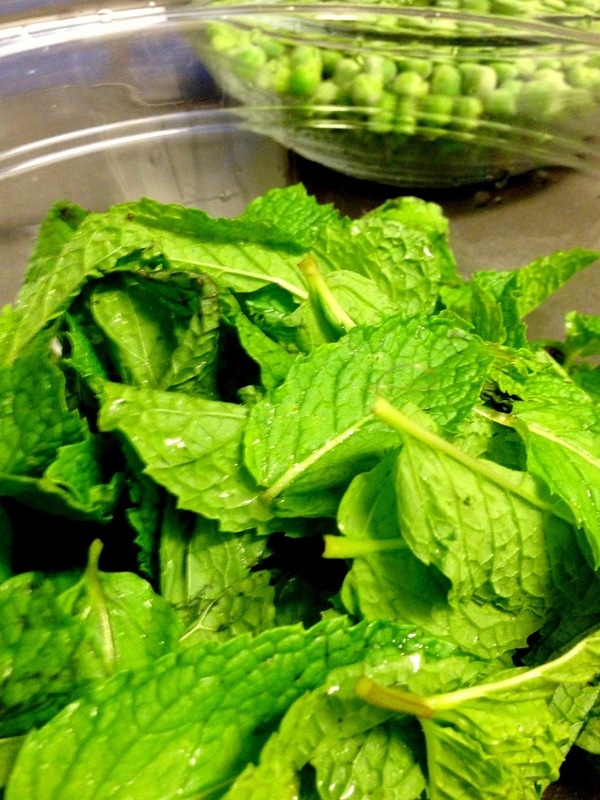 Serve with the rest of the mint and a dollop of yogurt for garnish and a nice crusty slice of bread for dipping.